Amelia Jaycen: Hi Max, thanks for coming. So what’s the news? Max Parola: Did you see that the Emotivs came in? M: It’s an EEG [electroencephalography] device. You could compare it to taking the pulse of a brain. An EEG measures the electrical activity in your brain and reveals patterns. A: Wow! That reminds me of a project I saw recently by a neuroscientist who mapped out human brain networks in colored lines so you could see the connections visually. M: That would use data that’s not from an EEG. But we really shouldn’t spend much time talking about brain imaging because it’s not something I’m an expert on just yet. A: Right, understood. But it’s good to get our feet wet. So you’re a psychology major. What do you plan to do exactly? M: I know that I want to do psychological research, specifically with technology. I think neuropsychology and cyberpsychology really need to meet up, and that’s kind of what is happening. We need to figure out how to incorporate technology into psychology for the benefit of mankind. A: Is that behind in your opinion? Taking too long? M: I think it’s underutilized. A: What is the current status of technology used in psychology? M: It’s definitely used a little bit, but it could be more intelligently designed. That’s why this collaboration between me and Sam really excites me, because that’s what I want my future position to be – the psychologist nailing down the grounding in theory, working with a computer scientist that can help with the application and the follow-through on that theoretical grounding. That’s going to be more and more common going forward. I could be wrong on that. But then again, that reminds me, in Kuhn’s The Structure of Scientific Revolutions, he said it was the people in my position that are being mentored that are going to usher in the newer ideas. A: I could agree with that. So, you enjoy theory and research is your dream? M: What I was talking about earlier – the convergence of psychology and technology – I’m not the first one to think of this. It’s already out there, and It’s called cyberpsychology. I’m interested in virtual reality because right now VR development is ahead of mixed reality, those systems aren’t necessarily out just yet, although the Microsoft Hololens shows some promise. But it’s interesting to think about it in terms of the paradigm in psychology that says your environment determines who you are, that it’s an interaction between your biological makeup and the environment. The introduction of the internet, computers, mobile computing, and that goes along with it has made vast changes in human cognition. But those technologies just act like a window into the digital world, whereas with virtual and mixed reality it is no longer a window that is limited to a space. From the perspective of the user, it is reality. At least that’s the goal. So I’m looking forward to studying those kinds of things as well. 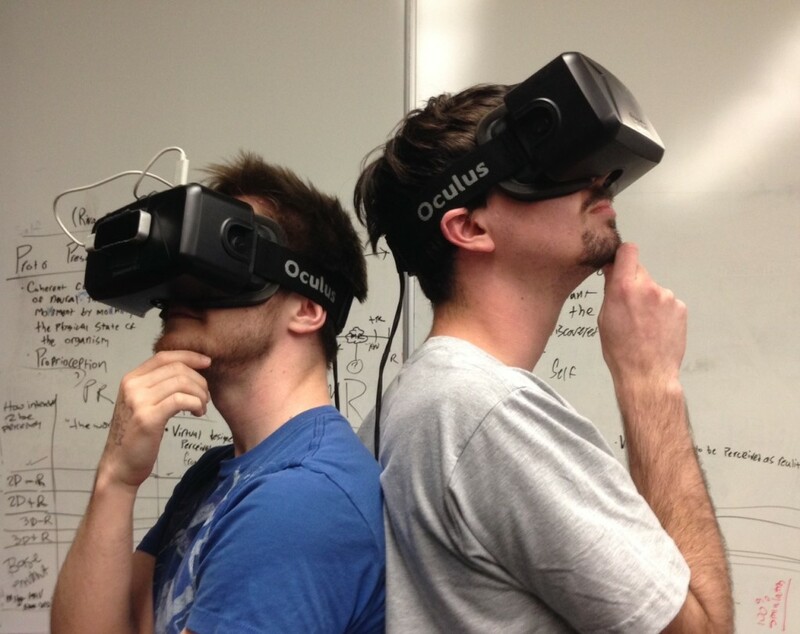 The VR Kings: Sam Johnson (left) and Max Parola (right) are studying virtual reality characteristics and the user’s degree of presence in virtual environments. A: Do you consider yourself an artist in any way? M: I don’t know, I think that in order to think like a psychologist you have to be creative – it’s certainly not entirely empirical thinking, and there’s some abstraction in theory. Professor Jenkins puts it in perspective so that when she’s talking about psychological measurement, that is the empirical nature of psychology: the interaction of theory–abstract concepts of humans and psychology–and measurement. The interaction between theory informs how you measure, and those measures inform what you say about the theory. So it’s the switching between this abstract and empirical thinking that a psychologist has to do, at least a research psychologist. A: I think you’re right, that does take a level of creativity. M: Yeah, I was talking about Kuhn earlier, and in The Structure of Scientific Relations he has this idea of paradigmic sciences. A paradigm is something that all of the other sciences can draw upon, it’s a fact, like gravity. It’s real and we know how gravity works. Whereas psychology is preparadigmic which means that we don’t have a theory we can empirically draw upon. Psychology is going to play a big part in this art + science make-up, and the reason it will draw more psychologists is because you have to be of that mind. You may not be producing pieces of art, but you do have to be willing to be creative. A: Do you consider yourself a scientist? M: I would consider myself more of a scientist than an artist. I like empirical. I like the facts. I don’t like wishy-washy. I definitely think more like a scientist. A: What is it about hard facts that you like? What is it that draws you about the empirical? M: To me that’s the human goal, to figure out the world around us. From what we’ve observed, humans are the only species that really knows its world, knows the universe. Like what Carl Sagan said, that humans are the way that the universe can know itself. It’s a very human goal to want to know the world around us. There are the paradigmic sciences that can definitively explain parts of the world around us, where psychology can’t necessarily. But I think maybe within our lifetimes psychology could be able to have those kinds of paradigms to draw upon. A: And you think technology is going to take it there? I think that’s an important thing to touch on, that we each don’t have the skill set to do what we’re planning to do. This would only be possible with a team. M: I’m not saying we don’t have definitive answers already, but I think technology is definitely going to fuel an exponential growth in definitive answers for psychological sciences. Neuroscience is not a new field, it’s been around for a while, but the invention of neuroimaging, for example, allowed research that just would not be possible before that technology was invented, there would be no way to do it. A: So tell me a little bit about your project @xREZ with Sam. How does that project touch on some of your interests? M: Well I’ve looked through a lot of VR literature specifically pertaining to presence, and it’s foundational for all things VR. So the project is a way to get our feet wet and practice designing a study from the ground up. It’s an interaction between Sam’s ability to build computer systems, and I’m better at designing experimental protocols. He’s helping me do things that I would never be able to do on my own. I think that’s an important thing to touch on is that we each don’t have the skill set to do what we’re planning to do. This would only be possible with a team. Our kind of interaction expedites the process. So it’s an interesting parallel between Sam and I. There’s the tech stuff, but then there’s also the experience of it – the experience of enabling each other. 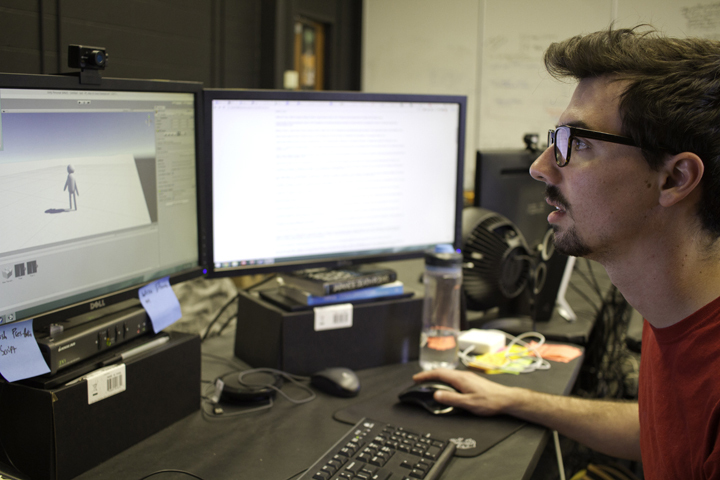 Max at his desk at xREZ Art + Science Lab designing a virtual environment. A: As psychology majors go, you’re pretty tech savvy. How do others in your field feel about this area of research tied to technology? Does it require a certain type of person like you, with interests in both psychology and technology? M: I like to think that virtual reality is exciting to everyone. I don’t think that’s the case. I guess that’s because I’m so infatuated with it. A: Why do you think people aren’t as excited by VR as you are? M: I think it’s because you can spend hours trying to explain to someone what VR is: “This is how it works, this is what it is, this is the technology behind it.” But then you realize, I’m just explaining tech specs. That’s not what it actually is. VR is actually the experience of it. And the VR I’ve been lucky enough to experience only scratches the surface. But I get to read about all of these other VR technologies, ones where you can actually walk around in virtual environment like the HTC Vive, or you can have the virtual environment there with you in the Microsoft Hololens. I have no idea how that feels. You can spend hours trying to explain to someone what VR is: “This is how it works, this is what it is, this is the technology behind it.” But then you realize, I’m just explaining tech specs. That’s not what it actually is. VR is actually the experience of it. A: Have you gotten to talk to Professor West about her CAVE 2 experience in Chicago? M: Yeah, I have! It’s a super cool she got to experience it. I couldn’t help but think about the differences in potential for something like a CAVE system versus consumer VR devices, they’re totally different. In a CAVE you look at the ground and you see the ground. You look at yourself and you see yourself. You have a panoramic vision that is motion-tracked and you can interact with it. It’s very different in the Oculus Rift or HTC Vive, for example. They’re mounted on your face, so you look up and you see the virtual sky, you look down and you see the virtual ground. You look at your arms and all you see are virtual arms. A: So it’s all virtual whereas CAVE has a lot of the elements of the physical world, non-virtuality, in-tact right? M: Right. And these consumer products like HTC Vive or Oculus are exponentially smaller and cheaper, and they’re a good solution to the problem of mobility. These are devices that somebody can have in their home. A: What is the mobility problem, exactly? M: The problem is: How do you move around in a space while using the device? How do you interact with that space? Consumer VR devices don’t solve those problems entirely– you can walk around but you’re limited within 15 square feet, you can interact but limited by two controllers and your fingers, there are still limitations – but it’s coming closer to real solutions. A: So when did you first become acquainted with the combination of art + science? M: It must have been @xREZ, I can’t think of any other place where someone talked to me about that combination. A: When did you join xREZ Art + Science Lab exactly? M: Let’s say a year ago today. We’re joking, but I think that’s almost right. It wasn’t a definitive date, it was just like any other day, and I came in for an interview, ended up here, and never went home after that. I remember I walked in the middle of the week, interviewed with Professor West, and I showed her a song I made, a horrible song called “Young Jung” where I sampled Carl Jung, the collective unconscious psychologist. Do you know Jung? A: Yeah I read his book Man and His Symbols about how the subconscious creates various themes in people’s dreams. But I made the mistake of reading it before bed each night and then my dreams were freaking me out because I was hyper-aware of all the psychological factors that created them. I was processing myself through a super weird Jung lens, and it was too much. I don’t suggest reading him that way. M: Yeah, sounds about right. So you are definitely familiar with Carl Jung. Well I sampled him talking about where he came up with the idea of the collective unconscious, and it was just an average day and he was getting on or off a bus and he suddenly “got it.” But at the time when I showed her that, I was a speech pathology and audiology major. 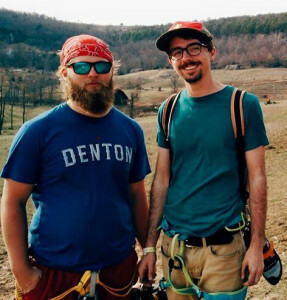 Max with UNT student Wade Dabbs on a spring break rock climbing excursion in Arkansas, March 2015. A: How has working @xREZ affected your plans, goals, or studies? M: I changed majors, changed what I was going to do with my life. A: From speech pathology to psychology? M: Yep. So the Lab showed me that research was 1) possible and 2) that I was good at it. I gained confidence, felt I was good at research, and felt I had some sort of influence on things. So that was a really good change. A: What else have you worked on at the lab? M: I’ve worked on several projects, and all of those could start with, “I had this crazy idea…” So I started from knowing I wanted to teach people how to learn using virtual reality. Education is really important, and VR opens up the opportunity for whole new ways of knowing and learning information. I also love psychology, and I want to help people out as much as I can. My goal is always: “What can I do to help people?” That led me to psychological treatment in virtual reality. You can shape reality in VR, so the most obvious way to do that is VR exposure therapy. Eventually maybe I’ll go forward on that. Now I’m working on presence, which is kind of foundational to all the other experiences. 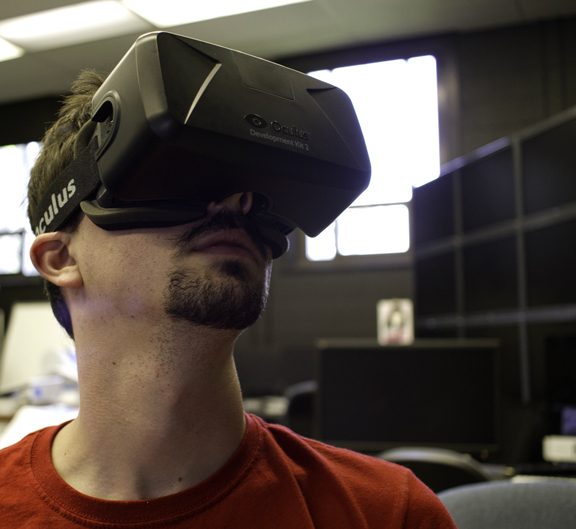 Presence is foundational in VR, and right now we’re laying down some groundwork. A: So when you say you can shape reality in VR, is that the problem with it for some people? For instance, you said you’re a fact-based person, you like facts and you’re attracted to the empirical. I am the same way, so being in a virtual environment I can’t help thinking, “This is a reality that is being created for me.” It’s not real. It’s not tangible and factual and something that I know is real. I bet other people want to know that it’s real too. Why does it matter if it’s not real? The Lab showed me that research was 1) possible and 2) that I was good at it. I gained confidence, felt I was good at research. M: Because you’re not bound by physical constraints. Here’s the thing. Since VR is not bound by physical limitations you can do things that are plausible in reality, but are not practical. You can do things that are just not possible. For instance, I’ve been in a virtual environment where I was sitting next to Buzz Aldrin on my way to the moon. I got to ride to the moon in a spaceship. That’s not possible. But that can teach me more than any textbook explaining what it’s like. Now knowledge can come from more experiential methods. Instead of having to learn this is what happened in the Civil War, you can go to a virtual environment that recreates a battle or important event in the Civil War. It’s a whole entire way of learning that’s just not possible in physical reality. It can be abstract. It can be fact-based. Virtual reality is whatever you want it to be – it’s a tool. I see it as a tool that is going to influence a lot of things. And people don’t realize the potential of it. It has way more potential than what it’s been given right now. This is a revolution of learning, a revolution of sciences. A revolution of therapies and all sorts of stuff. A: What do you know about how people’s brains respond to experiential learning versus fact-based learning? M: There is so much more memory tied to experiential learning. There are whole types of learning that are inaccessible by fact-based methods. You can’t just tell a person how to fly a Boeing 747. That’s why we have things like flight simulators, because you have to do it yourself to learn that kind of thing. Another example, I don’t think VR has been applied fully to things like physics yet. Physics in VR is really interesting because you can bend those basic rules. Currently you can only experience reality, physics like they are right now, on Earth. But the range of physics that you can experience in VR is incredible. You can go and look at individual atoms, you can go into the body and learn how things react in the body instead of just looking at pictures. You’re there. If you’re present, then you’re there and whatever you’re experiencing is actually real. A: So “presence” in virtual reality means you experience it as real? M: Yep, that’s presence. It’s the basis of pretty much every virtual environment.